The Cornucopia is of course a central feature of Thanksgiving and Harvest, especially in North America, where overflowing wicker baskets of fruit and vegetables are often found. The word Cornucopia is often used in the English language as well, where it is a simile for “abundance”; the word and the imagery of the Cornucopia though comes from Greek mythology, with the origins of the Cornucopia being traced back to Ancient Greece, where there were two stories told about the creation of the Horn of Plenty. The most prevalent story about the origins of the Cornucopia comes from the time when the god Zeus was a mere baby. To prevent Zeus being imprisoned by his father Cronus, Rhea, Zeus’ mother hid her child away in a cave upon Mount Ida on Crete. The baby Zeus was given over to the care of a nymph and a goat, although it is not clear whether the nymph or the goat was called Amalthea. The goat would nourish Zeus, but at some point the over exuberant Zeus broke off one of the goat’s horns. The nymph then filled the horn with herbs and fruit, and gave it to Zeus to eat from. The divine power of Zeus then ensured that the horn would provide a never ending supply of sustenance for whoever owned it. It is common in ancient sources to see the Cornucopia referred to as the Horn of Amalthea. A secondary myth about the creation of the Cornucopia appears during the adventures of the Greek hero Heracles. Heracles was determined to make the princess Deianira his own, but he was up against another potential suitor, the Potamoi Achelous. Achelous and Heracles would wrestle to find out which of them would be the successful suitor, and during the bout, the river god Achelous transformed himself into a bull, at which point Heracles broke the horn off. The horn then came into the possession of the Acheloides, the Naiad daughters of Achelous, who consecrated the horn, and transformed it into the Cornucopia. Alternatively Achelous was already in possession of the Horn of Plenty, and to retrieve his own horn from Heracles, he traded the Cornucopia with the demi-god. In either case, after its creation, the Cornucopia would become a symbol from many Greek deities. 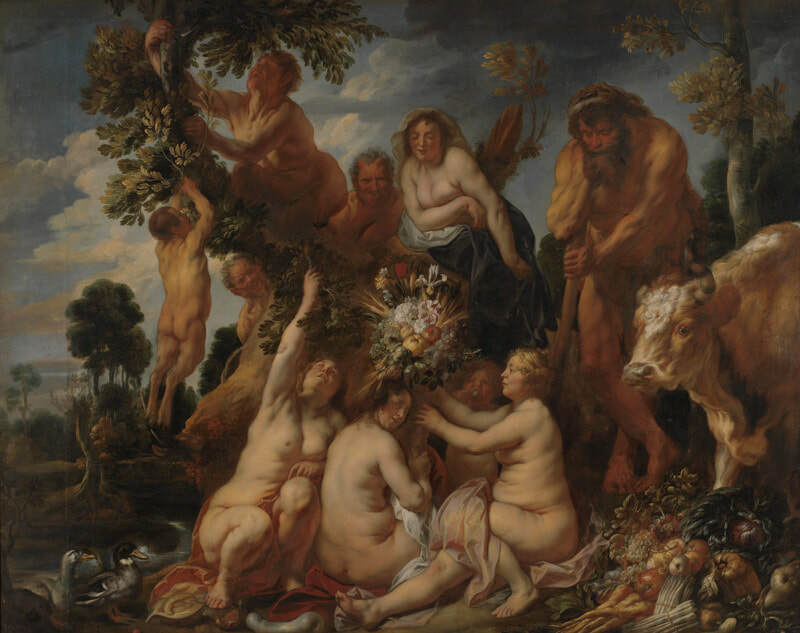 Demeter, the Greek goddess of Agriculture was often depicted with a Cornucopia overflowing with fruit, as was her son Plutus, the Greek god of Wealth (or Agricultural Bounty). 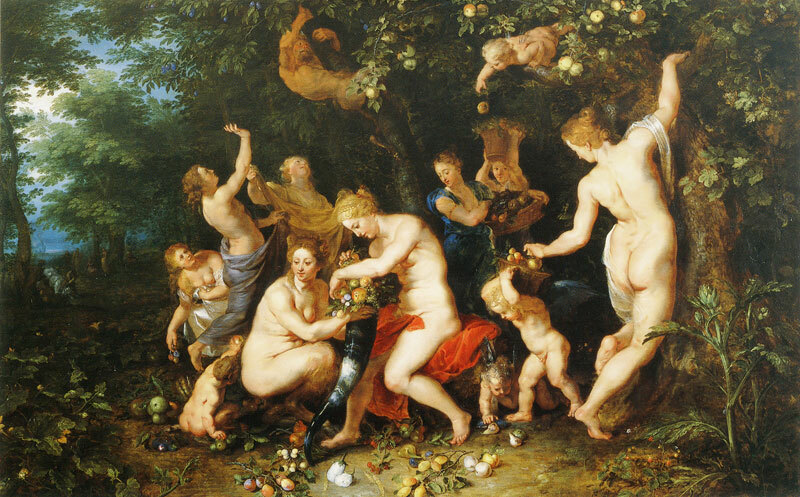 Other deities though were also commonly pictured with the Corncucopia, including Gaia, Hades, Persephone, Tyche (Fortune) and Irene (Peace and Spring).